Superduke 125 will soon be followed by 200cc and 350cc versions, assisted by high-volume manufacturer Bajaj. Truly, another chapter of world motorcycling history is being written as we breathe. Just as the European factories withered in the shadow of the Japanese Goliath in the ’60s and ’70s, European manufacturers are coming back into their own as the global market changes. Case in point is Austrian manufacturer KTM. Once just known to off-road enthusiasts for making tough, fast competition machines, the big orange factoryis now producing a full line of dirt, dual-purpose and street motorcycles. Its share of the USA market is growing, assisted by the introduction of new models like the Adventure, Superduke and RC8. But these are big, fast machines for expert riders—what about the entry-level market? Enter the Duke 125. A joint venture of KTM and Indian manufacturer Bajaj (which owns 39 percent of KTM), the 125 is a stylish, inexpensive single-cylinder four-stroke roadster that offers entry-level European and Japanese buyers a little more edge and excitement. Bajaj’s expertise in the small-displacement bike market—and inexpensive labor and parts resources—make it possible. And now there are rumors of 200cc and even 350cc versions for other markets. 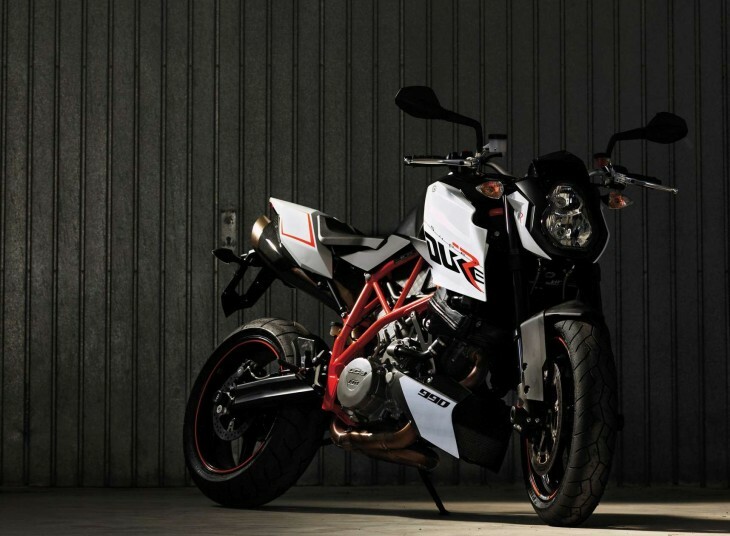 The Superduke R may be back for 2013, packed with a mega-powerful 1290cc V-Twin. Actually, it may be more than a rumor. I’ve seen a photo, allegedly posted to a Facebook account by a (reckless) KTM dealer, of a Powerpoint slide presented during the North America KTM Dealer’s meeting in June. On the slide, KTM”s new-product launch schedule is clearly spelled out. The news for 2012 is mostly mild updates, but 2013 promises not just a Duke 350 for the USA, but also a 1290cc version of the Superduke R. KTM fans will also be able to buy the new line of electric-powered Freerides, including a motocrosser and an enduro. For 2014, there’s even more interesting news. A 1290cc Adventure may also appear—does this mean KTM is putting a stroked RC8R Superbike motor into its entire lineup of big Twins? Makes sense, as KTM has three different big V-Twin engines coming out of its factory now. There is also apparently something called the “Moto3 350” slated for dealers in 2014. Will this be a street-legal version of the four-stroke Moto3 racebike KTM is developing? Or a roadracing version sold only to licensed roadracers, like the Red Bull Cup 125? Caveat: the photo I saw could be a carefully generated hoax (not that hard to make a Powerpoint presentation in KTM’s style, then snap a blurry shot of it with a camera phone), so take everything you’ve read with a grain of salt. But it sounds reasonable to me—I’m looking forward to a day at the go-kart track on a Duke 350. I really, really love my ’09 Duke 690. But my other bike is a ’11 Versys and, well, I miss not having a liter-bike. There, I said it. I’ll take a 1200 Super Duke in a minute. It’s about time the market is being brought something small. Im getting tired of big engined, slow handling machines. Going fast and enjoying a nice windy road has nothing to do with displacement. KTM(with Bajaj) is launching a 200cc duke this year end in India and they are planning to launch a 350 cc by next year, so definitely a 350 cc duke is in pipeline for masses. I will never buy a KTM. I will never forget how they betrayed Kenny Roberts and his GP team in a way that was so nasty it made the “KING” shut the whole operation down. I VOTE WITH MY $$$$ I hope they go out of bussiness. The KTM 200 Duke coming to Manila as of this writing , so ktm says but priced like the kawasaki Ninja 650 twin. Make the 350 into a 450 SuperDuke at that same 350 price and they might just sell. I love the KTM streetbikes, buuut, their price and dealers have always kept me away, almost (I have a 300 XCW). You can buy a Duc cheaper, BMW same price (usually), Jap non issue (they’ve conceded the market). Most KTM dealers are usually uninterested and unqualified to deal with street bikes. I couldn’t justify a 3 to 4K price difference to be unique for similar performance. I wish this wasn’t so as I REALLY loved the 990 Duke but couldn’t justify the price difference with a Buell 1125CR. That’s a non issue now but the Streetfighter and Hypermotards are too equal to make the jump. 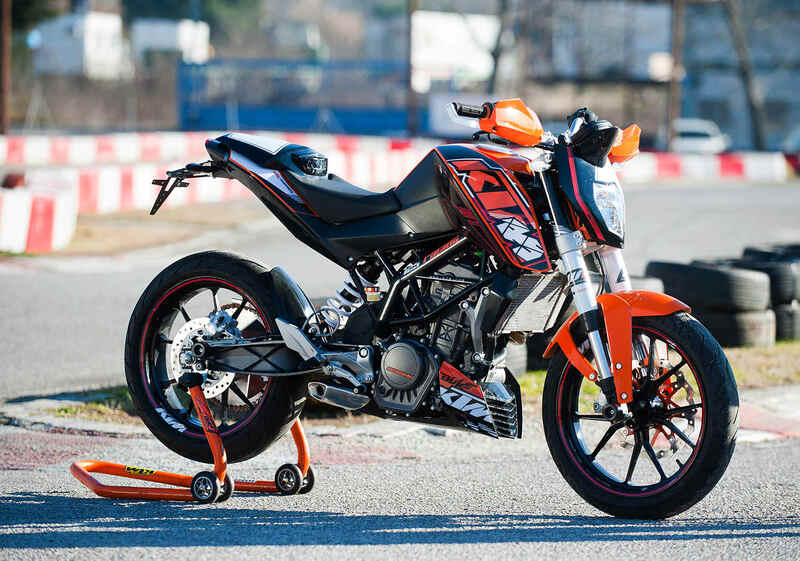 The 350cc super Duke seems like it would sell, don’t know about upping the displacement on their RC8/Dualsport bikes though, I just don’t see them getting a lot of new customers out of that. You can already buy a 170 hp sportbike from the major manufacturers (including BMW), and any dyno I’ve seen on the RC8 leaves it coming up a bit short of that. The E bikes will be the future at some point, and it’s probably smart of them to invest there. By the way, I don’t think you can be said to have a full line of street bikes without a sport tourer or tourer. Seems like the 990 already had plenty of stomp. I’m not sure why they think another ~300cc would change the sales. A 350cc Duke, now that would be something interesting. One of each please . That 125 looks like a hoot! Let’s hope the 350 happens; it would be a candidate for a great city bike. That’s funny….I didn’t read anywhere in the article, anything about 2 strokes, or DFI, but yet readers are undeterred from discussing it? Check the COMPLETE Slide in question here… Maybe is just Plastics…maybe not(DFI)…maybe is just wish(fool) thinking (pretty sure is that last one)…matters not to me. KTM has been known for having 2S DFI Mules for sometime now testing before the Pyramids were built…they just haven’t feel the REAL pressure from the market to THROW it out there on our greedy hands. Nope…no hard evidence…pure speculation. A *lightweight* 350 Duke could be really interesting, as would a *lightweight* RS125-sized 350cc street legal crotchrocket. If priced reasonably, I could be interested in one, possibly both. A reasonably priced KTM is a relative notion they’ll undoubtedly carry the same premium price of their current range. I’ve been waiting for the manufactures to produce a Roland Sands 450 MX conversion to supersport design. I hope this appears. A street-legal, DFI two-stroke enduro? With a wider powerband and no bulgy expansion chamber … and two-stroke maintenance and light weight? That’s a total game-changer and KTM would sell a bazillion of them. Why would a direct injection 2T not benefit from an expansion chamber. Just when i was thinking “they”(all the SPORT Twins Manufacturers) had put the lid on the Jar at the “1200 Mark” here comes “Little Orange” and goes 1290 BOOM! (fingers crossed)…even tho a lot could change if that schedule is real, 2014 it’s still far away and KTM seems keen on selling smaller not ever growing displacement models (350 Duke) and the trend to invest and sell on emerging third world markets were less than 250 is king and makes the doug to pay for all those RC8R’s R&D and what not. RC8R is not mentioned or could be missing in another slide from the presentation as another blog mentioned. I can’t see the RC8R going ~1300cc…that would be too much, maybe ? Then again, in true KTM Fashion the 90 could be there just for keeping up with their tradition of “’90s at the end”. Or it all could be a elaborated Hoax like Gabe mentioned and should be taken with a grain of salt. I forgot to add… I truly hope they go nuts and put DFI on their 250-300cc 2-Smokes for 2012 or 2013…and make some of them street legal…ok, ok, to not sound too haisty i would settle for them to be the first dirt bike OEM to go DFI and throw the gauntlet at Japan Inc. and see them step up to it. I like “Carbonator” too…(^_^ )…did someone forget to take his Midol this Morning ? Clever, Non-Clever…do u really have the time ? LOL.